This is a suggested two-day itinerary for anyone spending some time in the city. Rickshaws and buses are the best way to get around the city. A private vehicle would be nice for visits to Sarkhej and Adalaj, but not necessary. **These have scheduled tours, so be sure to follow the times listed. If you are in Ahmedabad on a Sunday, make it to the Ravivari Market (Gujari) under Ellisbridge. Situated in the heart of Gujarat, Ahmedabad District is home to state's bustling metropolitan city, Ahmedabad - characterized by its distinct spirit of enterprise and associated with Mahatma Gandhi, outstanding modern and Islamic-medieval architecture and several reputed institutions. The combined area of Ahmedabad and Gandhinagar districts marks a transition between the fertile lands of the east, the desert of the north and the scrub and grassland vegetation of the west and south. 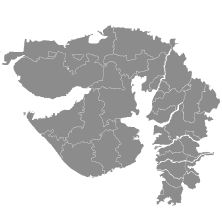 Other than a short stretch of coastline to the southeast along the Gulf of Khambhat, the district is land-locked. However it includes the 4000 year-old Harappan port of Lothal, once accessed from the Gulf, the only known port town of the Indus Valley Civilization. Gandhinagar, the state capital, was formed out of Ahmedabad District in the 1960s and famous for the exquisite Adalaj step well. Reflect in the tranquil spirit of the Sabarmati Gandhi Ashram, the powerful landmark from where Mahatma Gandhi started his movement for India's freedom through nonviolence. Wander through labyrinthine streets of Ahmedabad's walled city, studded with immortal masterpieces of Islamic influence while imbibing the local lifestyle that buzzes with a charm unique to the city. Bargain like a local while strolling down Law Garden street bazaar, dotted with open stalls that display bright costumes, embroidered handbags, silver jewelry and other local crafts. Revel in the magic as you celebrate Uttarayan on the rooftops of Ahmedabad, where people of all ages fill the sky with colorful kites to commemorate the passing of winter. Tour the exquisite collection at Calico Museum of Indian textiles that ranges across five centuries. Admire the sunset from the elegantly composed Sarkhej Roza, a mausoleum complex and medley of remarkable architecture. Enjoy birdwatching by boat at the picturesque Nal Sarovar wetland sanctuary, which attracts more than 200 species of migratory birds in the winter. Roam about the five stories of the exquisite 15th c. Adalaj stepwell, which served as a resting place for weary travelers.